My time at International Council of Systems Engineering (INCOSE) International Workshop (IW) 2015 was well spent. The Requirement Working Group (RWG) was well attended. We had full agenda. Our focus was to update the INCOSE Guide to Writing Requirements as well as developing as set of recommendations for updating ISO/IEC/IEEE 29148:2011 which contains provisions for the processes and products related to the engineering of requirements for systems and software products and services throughout the life cycle. Figure 1. Transformation of needs into requirements (Ryan, 2013). As shown in the figure rather than thinking the top layer of SE is the system level, there are non-system layers above the system level. As the diagram shows, above the system layer there is a business operations layer, on top of that a business management layer, on top of that and enterprise layer. Within this structure, there are business needs, stakeholder needs, system needs, etc. Through analysis, these needs are turned into requirements at each layer. – An entity is a single thing to which a need or requirement refers: an enterprise, business unit, system, system element (which could be a product, process, human, or organization). There are entities at each layer. – Needs are the result of a formal transformation of one or more concepts for an entity into agreed-to expectation for that entity to perform some function(or possess some quality (within specified constraints). – A requirement statement is the result of a formal transformation of one or more needs into an agreed-to obligation for an entity to perform some function or possess some quality (within specified constraints). All to often the reason why many project fail is due to issues at the layers above the system level – a failure to understand the business needs and requirements as well as the stakeholder needs and requirements. No matter which layer, requirements for that layer have certain characteristics. There are characteristics that address the transformation process of going from needs to requirements as well as going from one level of requirements to the next. There are also characteristics concerning the “agreement” aspect of requirements as well as characteristics on the sets of requirements. – Necessary –defines an essential capability, characteristic, constraint, and/or quality factor. If it is not included in the set of requirements, a deficiency in capability will exist, which cannot be fulfilled by other requirements. – Appropriate – specific intent and amount of detail is appropriate to the level of the entity to which it refers. – Conforming – conforms to an approved standard template and style for writing requirements. – Complete – requirement sufficiently describes the necessary capability, characteristic, constraint, or quality factor to meet the entity need without needing other information to understand the requirement. A set of requirements is a structured set of agreed-to requirement expressions for the entity and its external interfaces documented in an Entity (Enterprise/Business Unit/System/System Element/Process) Requirements Specification (Document). Other changes to the Guide include adding rationale for each characteristic as well as providing guidance in understanding the characteristics. The Guide also contains a set of rules that are linked to the characteristics. Following the rules should lead to well formed requirements that have the above set of characteristics. Another major update we made to the Guide was to add a list of attributes that can be associated with each requirement to aid in the development of the requirement, aid in tracking verification and validation, aid in the management of the requirement, and aid in understanding the context of the requirement and helping to reuse the requirements. The INCOSE Guide to Writing Requirements update was approved for release at INCOSE IS 2015. The Guide was updated at IW2017 and has been released in time for IS2017. 9 Responses to "INCOSE Guide to Writing Requirements updates made at IW 2015"
All looks common sense and normal practice. I’m surprised that rationale was not already a standard attribute as I cannot remember not using it. I would be very keen to see the new guidelines when published. I have been talking in terms or transformation for many years – much better for conveying the nature of the processes than decomposition. I am also be keen to obtain the new guidelines. Any indication when it will be published? Currently the INCOSE Guide to Writing Requirements is going through a review cycle. For INCOSE members who are on the Requirement Working Group membership list, we will be sending out a copy for review and comment. After addressing those comments, we will submit the revised copy to the INCOSE Technical Operations group for their approval. We hope to have an approved copy ready for release to the general INCOSE membership in time for INCOSE IS 2015 in July. Always interesting to see “unambiguous” as an attribute of a requirement. It would seem that a truly unambiguous requirement would not need any lower level requirements. Hence only the bottommost level requirements have any hope of being unambiguous. Ambiguous: able to be understood in more than one way, having more than one possible meaning, not expressed or understood clearly. In the guide we define unambiguous as: The requirement is stated in such a way so that it can be interpreted in only one way. The intent of a requirement must be understood in the same way by the writer, the designer, and those doing verification following the “reasonable person” guideline. Ambiguity leads to interpretations of a requirement not intended by the author, and the ensuing problems, including project delay and even perhaps litigation and financial loss. With these definitions in mind, requirements at any level must be unambiguous. It is not a question of decomposing a thought to an atomic level, it is about whether or not the requirement statement intent is clear to the reader, at all levels. Question	Is it necessary to have three hierarchical layers above the system layer? Are the Enterprise layer, and the Business Management layer and the Business Operations layer really distinguishable and meaningfully different? “The system” is usually correctly viewed as the solution to a business problem. Systems may be considered as a hierarchy since a system element is a component of the next-higher system, but is also a system in its own right. Objectives may also be viewed as a hierarchy since an objective will be achieved once all next-lower objectives have been fulfilled. But even if the term “hierarchy” is used for both, that does not make them the same hierarchy. These two hierarchies are based on completely different principles, and to mix them into one single hierarchy does not make sense. Or am I missing the point somewhere? To be fair, you do call the Enterprise layer, the Business Management layer and the Business Operations layer “non-system” layers. Why do you make that point? And why is a business need at a higher layer than a stakeholder need? Does the problem domain really need to be at a higher hierarchical layer than the solution domain? To my way of thinking that is not at all necessary. Does the environment of the business problem not become the environment of the system that solves that business problem? Suggestion	I think you are needlessly using confusing terminology. Terminology is the framework within which people reason and argue about a topic, and hence the selection of terminology should be carefully considered. I would suggest that it would be better if you use the term “specification” exclusively in the solution domain, and not at all in the problem domain. After all, a specification is an engineering document. The intent would be to make an explicit distinction between those domains. The term “requirement” is by definition valid in both domains, but why not use “requirement document” in contrast to “specification” in the problem domain? Stakeholder requirements should be solution agnostic, or implementation free, and at most should merely place constraints on the solution. As soon as the most appropriate solution gets defined, then use the term “specification” for that. In other words, make a clear terminological distinction between a solution specification and a problem statement. This convention would not change the principles you are discussing but might just prevent some conceptual confusion. All good questions. Studies have shown that a main reason projects fail is because they failed to understand the drivers and constraints dictated at these “non” system layers. From a systems thinking viewpoint the systems (products) are being developed within the infrastructure of the organization developing the system as well as the infrastructure of the customer of the system for systems being developed for another organization. It is at these layers where business rules and requirements reside as well as standards. A second point is that the framework showing all these layers is generic for any kind of organization. Smaller organizations may combine some of these layers. No mater how your organization is structured, needs and requirements exist at a number of levels. There is an enterprise view in which enterprise leadership sets the enterprise strategies in the form of a Concept of Operations (ConOps) or Strategic Business Plan (SBP); a business management view in which business management derive business needs and constraints as well as formalize their requirements; a business operations view in which stakeholders define their needs and requirements; and a systems view in which the system is defined in logical and physical views. Subsequently, there are views at the lower-level of the subsystem and other system elements. Note that a system may comprise a number of elements including products, people, and processes. Together these elements enable a needed capability for the organization. The enterprise has a number of strategies that will guide its future. From our perspective, a system has its genesis in the ConOps or SBP that communicates the leadership’s intentions with regard to the operation of the organization—in terms of existing systems and systems to be developed. At this layer the ConOps, or SBP, defines the enterprise in terms of ‘brand’ and establishes a mission statement and corresponding goals and objectives, which clearly state the reason for the enterprise and its strategy for moving forward. The Business or Mission Analysis Process begins with the organization’s mission or vision statement, goals and objectives communicated by the ConOps or SBP. Business management uses this guidance to define business needs, largely in the form of a life-cycle concepts, which capture the business management’s concepts for acquisition, development, marketing, operations, deployment, support, and retirement. These concepts are then used to define specific needs for that layer. The business needs contained in the life-cycle concepts are elaborated and formalized into business requirements, which are documented in the Business Requirements Specification (BRS) or Business Requirement Document (BRD). The process by which business needs are transformed into business requirements is called mission analysis or business analysis. Once business management is satisfied their needs and requirements are reasonably complete, they pass them on to the business operations layer. Here, the Stakeholder Needs and Requirements (SNR) Definition Process uses the ConOps or SBP and concepts contained in the life-cycle concepts as guidance. 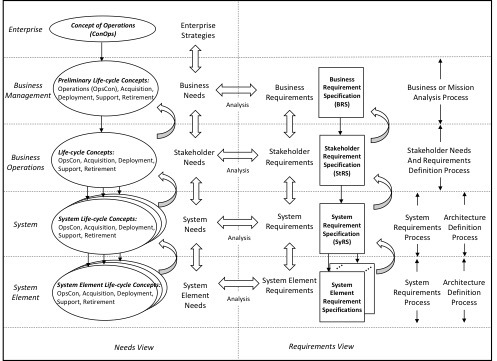 The Requirements Engineer (RE) or Business Analyst (BA) leads stakeholders from the business operations layer through a structured process to elicit stakeholder needs—in the form of a refined OpsCon or similar document and other life-cycle concepts (see Figure 1). The RE or BA uses a structured process to elicit specific needs, as documented in user stories, use cases, scenarios, system concepts, or operational concepts. For further discussion of the Concept of Operations and the Operational Concept Document, and their interplay, see ANSI/AIAA G-043-2012e, Guide to the Preparation of Operational Concept Documents. Stakeholder needs are then transformed into a formal set of stakeholder requirements, which are documented in the Stakeholder Requirement Specification (StRS) or Stakeholder Requirement Document (StRD). That transformation is guided by a well‐defined, repeatable, rigorous, and documented process of requirements analysis. This requirements analysis may involve the use of functional flow diagrams, timeline analysis, N2 Diagrams, design reference missions, modeling and simulations, movies, pictures, states and modes analysis, fault tree analysis, failure modes and effects analysis, and trade studies. These details are documented in the Guide. I hope this helps you understand why we include these layers. Concerning your comment concerning the use of specification vs requirement document. Looking across all domains and industries, there is no common usage of these terms. The real issue is that both the words “specification” and “document” are ambiguous without a modifier. To remove this ambiguity, both words need to have an adjective that makes clear the contents. Thus you can have a requirement specification or a requirement document. With the adjective it is clear what the contents are “requirements”. Thus you can define a requirement specification as a document that contain requirements. I can also have a design specification which documents the design, and end-item specification that contains the build to requirements and drawings, or an as-built specification which documents the actual as built system. For a more detailed discussion see my blog: What is the difference between a Requirement and a Specification? As far as problem space vs solution space. Once you have defined user needs and a concept to meet those needs you are in the solution space. Thus the requirements transformed from the needs and concepts are in the solution space – they represent an agreed-to solution to the problem the system is being developed to address. As design progresses, the solution is better formed and understood. Once the problem is stated, the rest of the systems engineering process is in the solution space. Ad, I also asked Dr. Mike Ryan who is the originator of the concept of layers above the system level. Dr. Ryan is from the School of Engineering and IT (SEIT) at the University of New South Wales, Canberra, Australia. The key point is that when an organization develops a system, they need to adapt to system thinking and address the macro system in which the system under development must work. Dr. Ryan illustrates this very clearly in his response to your question/comments. “The three levels are necessary because they represent three significantly different perspectives that must be activated in a top-down manner. Consider a wood-felling company whose management have just returned from a 1930s trade show where they witnessed a demonstration of the revolutionary chainsaw that has been introduced to the market by Andreas Stihl’s new company. Although the ability to cut down trees at a greater rate is very attractive, the company cannot simply sit down and write a system specification for the procurement of chainsaws. Further, they cannot even ask stakeholders at the business operations level to describe what they want out of a new chainsaw capability in the form of stakeholder needs and requirements. The current operational managers are used to managing axe men who are not able (and probably not willing since they are going to be re-trained at best and, at worst, let go) to describe in any manner how the new tool is to be operated, since they have no familiarity with the operating procedures, training, safety or the maintenance necessary for the new equipment. Similarly, the logistics staff at the business operation level will know, in considerable detail, current logistic information such as the number of axe handles broken per linear metre of hardwood cut in support of current operations, but will know nothing of the support for a tool that will need a different maintenance methodology, significantly different support materials such as fuel, different storage, many more parts of much greater variety, and so on. Before the business operations level can even begin to address their requirements, therefore, business management layer above them must decide how the new capability is to be introduced. Is the chainsaw being procured to fell trees faster, or to cut down the same amount of wood more efficiently (with fewer operators, for example)? In either case, will the current tradesmen be retained and retrained, or will new operators be required? What new logistics support will be required and how will it be acquired? How will the company transport materials, such as fuel, that are not currently supported? How will the new capability be maintained, and by whom? How will the new capability be deployed—across all operators at once, or team by team, or area by area? If wood is to be produced faster, will additional transport vehicles be required to extract the product, and will additional sawmill capacity be required? Ultimately, of course, business management must also consider whether they want to produce more wood at the risk of flooding their own market resulting in a falling price? Before an acquisition can be considered, therefore, the business management level must draft the initial versions of the operating concept, acquisition concept, deployment concept, support concept, and retirement concept. Those concepts can then be fleshed out by the selected stakeholders from the business operations level before passing on to systems designers to develop the system specification. Looking at the system development top-down then, the need for the three distinct levels is evident and we can see why the lack of business management attention is the principal reason for project failure.